Some people can eat whatever they want and stay slim (think Bob at 20, 30, 40 and our son Cole now). Not me. I've always had to watch myself. Back in the day, that meant routinely lunching on graham crackers and dill pickles. It was a great way to limit calories, but at 50-something, I'm also concerned about what's healthy. After all, Bob and I are both cancer survivors from families prone to osteoporosis and heart disease so eating right is a must. That's why I like these Chicken Fajita Wraps from The Low-GI Slow Cooker (Ulysses Press, June 2013, $14.95). You get a 350-calorie main dish with authentic Tex-Mex taste that's packed with vegetables and protein. And since the slow cooker does most of the work, it's simple to prepare. Packed with nutrition as well as authentic Tex-Mex taste, this yummy main dish has only 350 calories. You begin by marinating chicken breast strips in lime juice (no wonder they're so tender) and a mix of eight, zesty spices (oregano, chili powder, paprika, cumin, cayenne, garlic powder, sea salt and pepper). No cayenne? Try substituting Tabasco or your favorite hot sauce. You can let this mixture sit in the fridge anywhere from 30 minutes to overnight. Then get out the slow cooker. I spritzed mine with baking spray to make clean up easy. Next, slice some onion plus green, yellow, orange and red bell peppers (so colorful!). Put the veggies in the pot, top them with the un-drained chicken marinade, cover and cook on low. Three to four hours later, you're ready to serve up one of the most flavorful chicken fajita fillings ever. The colorful filling includes chicken marinated in lime-juice and eight, zesty spices; onion; and a rainbow of fresh bell peppers. 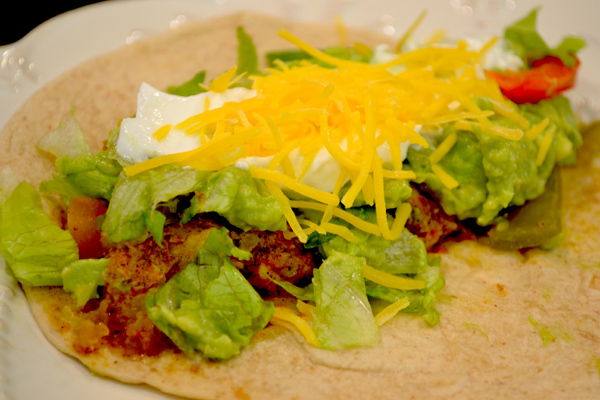 To complete the wraps, layer the chicken-veggie filling, shredded romaine lettuce, mashed avocado and plain Greek yogurt on whole wheat tortillas. I also added shredded 2% cheddar cheese and used fajita-size tortillas but the soft-taco version (about 7 inches) makes a better choice. Besides scoring big in the health department, these four-layer wraps are a treat for your taste buds. Although my hubby normally refuses anything whole wheat, this nutritious dish has so much going on we never noticed the difference. Besides scoring big in the health department, it's a treat for your taste buds. We both went wild over the tender strips of spicy chicken and vegetables. 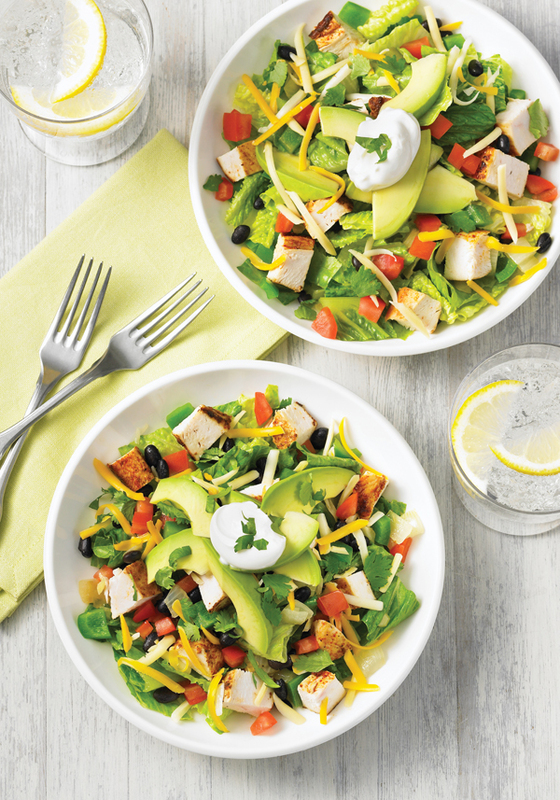 Plus, the creamy avocado and yogurt toppings reminded us of guacamole and sour cream without all the calories. Combine the chicken, lime juice, oregano, chili powder, paprika, cumin, cayenne, garlic powder, salt and black pepper in a large Ziplock bag. Marinate overnight or at least 30 minutes. Place the onion and bell peppers in the slow cooker. Place the marinated chicken on top of the vegetables in the slow cooker, along with any juices in the bag. Cover and cook on low for 3 to 4 hours or on high for 1 to 1 1/2 hours, or until chicken is tender. 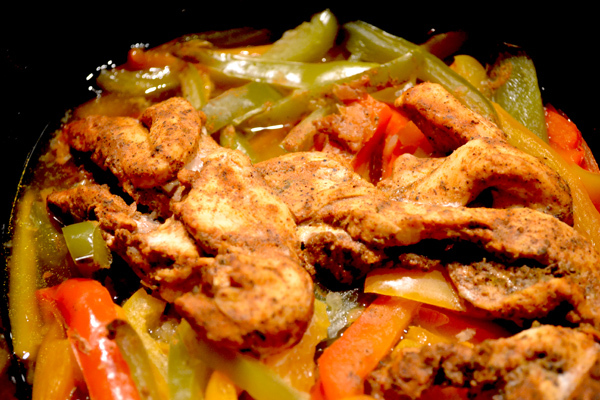 Scoop cooked chicken and vegetables into the center of each tortilla into a vertical line. Top with 1/4 cup shredded romaine, 1/4 of the mashed avocado and a dollop of Greek yogurt. Fold the left side of the tortilla over the chicken and vegetables, fold the bottom of the tortilla upwards and tuck in under the fold. Continue rolling until completely wrapped. Repeat with remaining tortillas. Serving Suggestion: Be creative with your toppings for the chicken and vegetables. Serve with your favorite fresh salsa, shredded low-fat cheese, or a serving of black beans. 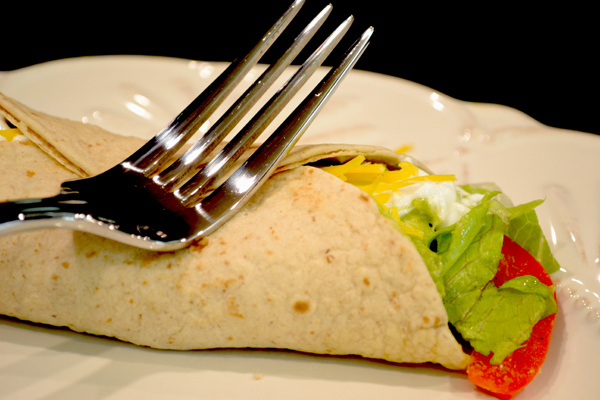 Serving Size: 1 wrap with 3 ounces chicken breast, 1 cup vegetables, 2 tablespoons avocado and 1 tablespoon Greek yogurt. Other Works: Dr. Mariza Snyder and Dr. Lauren Clum run the Specific Chiropractic Center in Oakland, CA. Anna Zulaica is the founder and owner of Prestol Catering in Berkeley, CA. They are the authors of The Antioxidant Counter and The DASH Diet Cookbook. 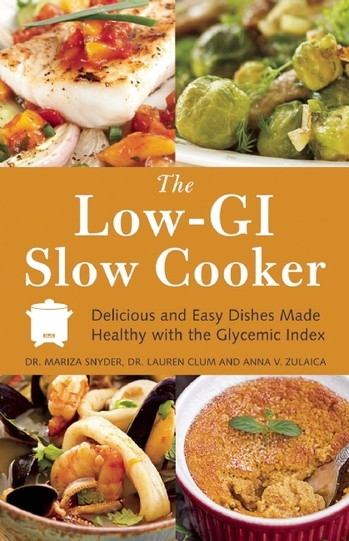 What's Inside: Healthy slow cooker recipes designed to nourish your body and soul. Since they score low on the Glycemic Index, these ideas can help you get healthy and lose weight while lowering the risk of diabetes and heart disease. In most cases, you simply toss the ingredients in your slow cooker and return later to home-cooked goodness. Think French Toast Casserole, Smoky Turkey Chili, Mushroom and Eggplant Lasagna, and many more delicious, nutritious choices. * Reprinted with permission from Ulysses Press © 2013 by Dr. Mariza Snyder, Dr. Lauren Clum and Anna V. Zulaica. All rights reserved. May not be reprinted without publisher permission.